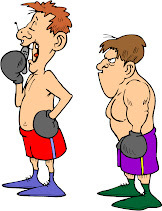 Lawyer-boxer's Blog: Is Boxing "Losing the Battle of Evolution to UFC"? Is Boxing "Losing the Battle of Evolution to UFC"? In this article, Keith Terceira, a respected sportswriter at BoxingScene.com, suggests that boxing is indeed losing the battle. Mr. Terceira points out valid concerns and he makes a lot of good points. However, there is no reason boxing can't rise to the occasion and be every good as the mixed martial arts (MMA) fighting. Where there's a will, there's a way. The fundamental question, though is: do boxing and its people have the requisite will? We shall see.